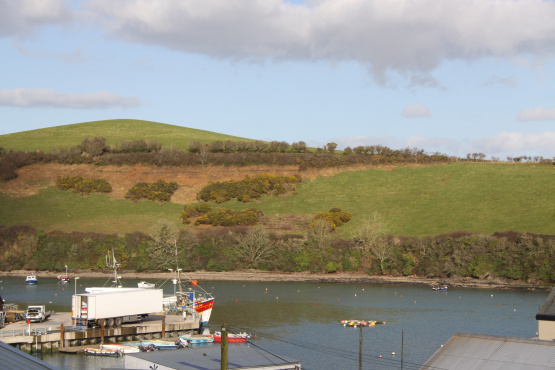 2 Croft View Terrace is located on an iconic Salcombe street, in the heart of this popular town, where traditional boat builders and local businesses sit side by side. It is just a short level walk from this delighted 3 bedroom terraced house to the main high street, past the RNLI Lifeboat moored in the harbour and terraces of quintessential coastal South Hams cottages. The property sits in an elevated position with a new decked terrace by the front door, ideal for el fresco dinning. The focal points of the light and airy sitting room are the feature tiled fireplace and pleasant views across to nearby countryside. There is a good size cottage kitchen /dining room with rear access to a courtyard and useful store. The back gate gives access onto a path that leads to a lane into town. There are three bedrooms, with the master bedroom on the second floor enjoying water views across to Batson Creek from the two large skylights. A light filled bathroom overlooks the rear courtyard and grassy path. 2 Croft View Terrace would make a lovely home or an ideal lock up and leave in a sought after location close to nearby pontoons and slipways. 2 Croft View Terrace is offered for sale at £379,000. For further information please contact Marchand Petit’s Salcombe office on 01548 844473 email salcombe@marchandpetit.co.uk.